It's a little strange, but it's August and there is a chill in the air here in Chicago. I have to admit that after the hottest summer I have ever experienced in my life I am kind of loving it. Also, fall is my favorite season so I certainly won't complain about a few extra weeks of crisp cool air and sleeping with the windows open. With that in mind, I made a more hearty fall appropriate baked dish for dinner this week. Truthfully, I was going through my cupboards to figure out how I could use up some of the random things I have in there and came across some pasta shells that have been around forever. Making stuffed shells is a much more involved process than a normal pasta dinner, which is probably why they've been in my pantry for months. The last few times I have prepared them I have done a pretty traditional ricotta and spinach stuffing, but this time I decided to change it up a little. 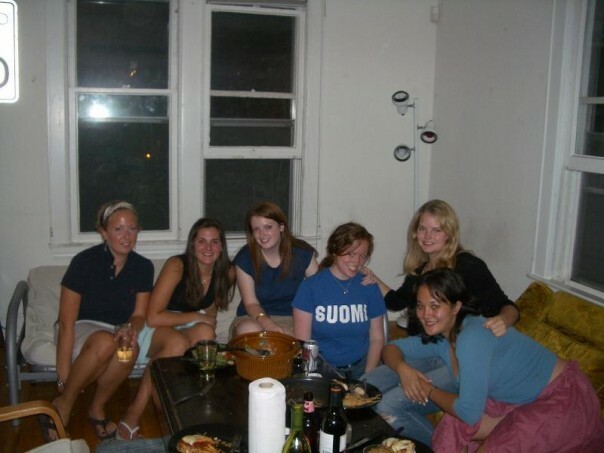 Back in college my girlfriends Liz and Maggie hosted a Mexican-themed dinner party and somehow ended up preparing something like 10 lbs. of taco meat-- only a fraction of which was eaten at the party. Everyone in their house was eating tacos all week and they had barely made a dent in the leftovers when Maggie decided to get a little innovative in the kitchen and she made Mexican stuffed shells for her roommates one night. Brilliant! I put my own spin on it this week and created chicken enchilada stuffed shells. There's lots of room here for getting creative with fillings, sauces, and toppings. So have fun, make it your own, and enjoy! 1 package Frontera Green Chile Enchilada Sauce *This is my cheat! Bring a large pot of salted water to boil and cook shells according to package directions. Drain the pasta well and set aside, allowing to cool. Preheat the oven to 400 degrees. Heat a sautee pan over medium high heat and add olive oil. Season chicken with salt and pepper and add to the pan, browning on each side. Once the chicken is almost cooked through break it into smaller pieces with a spatula. Add onions and peppers to the pan and sautee until softened, 3-4 minutes. Add garlic and tomato paste and sautee for another 2 minutes. Add tomatoes, cayenne pepper, chili powder, and cumin to the pan. Combine ingredients and cook for an additional 5-6 minutes. Remove from heat and let the chicken mixture cool slightly. Combine chicken mixture with cilantro and 1/3 cup shredded cheese. Spread a thin even layer of enchilada sauce around the bottom of a small glass baking dish. Fill each cooked shell with a few spoonfuls of the chicken and cheese mixture and arrange in baking dish. Pour remaining enchilada sauce evenly over the shells and top with remaining cheese. Bake for about 15 minutes until cheese is fully melted and bubbly. I also like to put the shells under the broiler for 3-4 minutes until the cheese browns a little on top. Serve with sour cream, avocado, and scallions and enjoy.